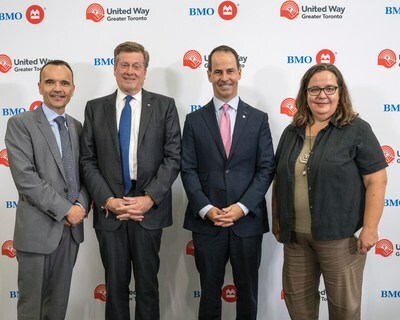 BMO Financial Group has announced a $10 million commitment to United Way Greater Toronto to encourage economic growth in the Greater Toronto Area, and launched an initiative to bring together business leaders to work with community and come up with break-through approaches to reducing economic disparity in the region. "This is the next step in strengthening GTA neighbourhoods and ensuring that everyone has access to opportunity – regardless of your postal code," said Daniele Zanotti, President and CEO, United Way Greater Toronto. "In the past decade, we've worked with communities to build Hubs, empowered residents to take action on local issues and promoted investment in neighbourhoods that are being left behind. But we can't do it alone. BMO's leadership with the private sector will ensure that we are creating inclusive local economic opportunities across Peel, Toronto and York." Economic disparity between neighbourhoods in the GTA has steadily grown to become a seemingly intractable problem. United Way Greater Toronto, along with its long-time corporate supporter, BMO Financial Group, today launched a concerted five-year commitment to find innovative ways to dramatically reduce the gaps in economic prosperity, and to create lasting inclusive economic vitality in neighbourhoods throughout the region. In October, leaders from United Way, BMO and other prominent local businesses will begin meeting to devise solutions to the problem and propose ways to ensure that the fruits of economic development are shared in all parts of the community, and not just its wealthiest neighbourhoods. “We can’t afford to let our city continue to become a checkerboard of advantaged and disadvantaged neighbourhoods,” Darryl White, CEO of BMO Financial Group, told an audience of donors and other United Way supporters Sept. 20 at AccessPoint on Danforth, a Scarborough community hub. "This kind of partnership is a first for United Way Greater Toronto," said Mr. Zanotti. "We're excited to see private sector thinking on this issue, and working with community, government and other sectors to bring ideas into action for meaningful change." Corporate partners will work directly with community leaders from across the region to implement programs locally. The first meeting of the leadership table will be in October and the money will be spent over five years. In Australia, the state of Victoria requires its agencies to procure goods and services from social enterprises whenever possible.